Gotta give credit to Pete for that title…he thought it up quite a while back when we were doing other pieces on Stimson Lumber. I’d asked him about using it and he had given me the go ahead. Given yesterday’s development, it’s hard to resist. Thanks Pete. Stimson is disconnecting the Bonner Post Office from its septic system. As the story goes, as part of the processing of shutting down the mill, Stimson is disconnecting the Bonner Post Office from company’s septic system. It’s been connected for something like 100 years. Scott Cooney, the developer who had a deal with Stimson to buy the entire site before it fell through earlier this month, is dismayed. He currently owns most of the old home sites in the town – including the Post Office and will, because of his lease with the USPS that requires the building to have a bathroom, have to install a temporary tank until he can install the community system he is planning for all of his new ownership. Cooney is dismayed. I’m not. Are you? On another note – given all my past criticism of Stimson lying about “not having any logs” (try this post) – Stimson is keeping its “White House” open to maintain logging operations on its land holdings in southwest Montana. They have logging sales in progress, planned, and in the planning process. Stimson is also continuing to look for forested property to purchase, and maintains that it will continue to manage its holdings and timber sales in the area. And that is straight from the horse’s mouth, folks. The Missoula YWCA is hosting a panel today from noon to 1:30pm on the impact of racism and sexism in this year’s presidential campaign. For some reason, the YWCA director saw fit to invite me to sit on the panel along with local luminaries, Representative Diane Sands and the MHRN’s Kim Abbot. YWCA Missoula invites you discover the impact of “Racism and Sexism in the 2008 Presidential Campaign” through a panel discussion and brownbag lunch on Thursday, May 29, from noon to 1:30 p.m. at the YWCA, 1130 W. Broadway. Call 543.6691 for info. Come on down and watch me embarrass myself. Heck, you can pitch in with some biting questions of your own! There are only four days left avoid the rush and cast an absentee ballot. Otherwise, you’ll need to visit your polling place on Primary Election Day, June 3rd. To accommodate as many voters as possible Vickie Zeier, Missoula County Elections Administrator has extended the elections’ office hours from 7:30 a.m. to 7 p.m. through the end of this week. Next Monday, June 2nd, you can cast an absentee ballot from 7:30 a.m. to 12 noon. Zeier expects record turnout for this year’s primary, which means polling places will be busy. Contact the Missoula County Elections office, 258-4751 to learn more about voting absentee. Gifford Pinchot was the first chief of the United State Forest Service. While the below rules were brought forward during his time of teaching at the Yale School of Forestry (from 1920 to 1920), there is a world of truth to them even today. They illustrate, to me, one of the basic causes of mistrust with government, and today’s chaos and partisanship. It isn’t disagreement with policies or philosophies – it is the failure to tell the truth that leads to an inherent mistrust which is much harder to get back than it is to keep. In other words, once the damage to trust has been done, it’s a really steep hill to climb back up and re-establish. Elected officials, too, would do well to take notice. Sometimes, theirs is the hard decision to make, but way too many people have Drive FastTakeChances’ opinion of how government works – in this case, local government. DriveFast’s opinion isn’t rare – I suggest that locally it is all too common – and, frankly, there is a whole hell of a lot of truth to it. Like all good rule makers, Pinchot violated at least one his maxims – number 7 – and he paid the price. Perhaps that is why it appears on this list – a lesson learned. 1. A public official is there to serve the public and not run them. 2. Public support of acts affecting public rights, is absolutely required. 5. Use the press first, last, and all the time if you want to reach the public. 6. Get rid of attitude of personal arrogance or pride of attainment or superior knowledge. 7. Don’t try any sly or foxy politics. A forester is not a politician. 8. Learn tact simply by being absolutely honest and sincere, and by learning to recognize the point of view of the other man and meet him with arguments he will understand. 9. Don’t be afraid to give credit to someone else even when it belongs to you. This is the mark of a weak man, but is the hardest lesson to learn. Encourage others to do things. You may accomplish many things through others that you can’t get done on your single initiative. 10. Don’t be a knocker. Use persuasion rather than force, when possible. [There are] plenty of knockers to be had. Your job is to promote unity. 11. Don’t make enemies unnecessarily and for trivial reasons. If you are any good you will make plenty of them on matters of straight honesty and public policy and will need all the support you can get. On this Memorial Day, I’d like to begin by saying that we are fortunate to have men and women committed to fighting for our freedoms. They are not free and those in uniform pay that price voluntarily. To them, I want to wish safety and the chance to come home to stay. I was born in Superior where my family settled around a century or so. My grandma on the Hankinson side served as Mineral County Clerk of District Court for years before retiring in the 1990’s. My Aunt on the Hankinson side is a sitting Judge in Colorado. Civil service is a family tradition, one which we do not take lightly. Responsibility and accountability are foremost in our value set. If elected, I promise to be responsible with the trust of the people of House District 91, but I also promise to be accountable for every decision I make. Legislators should be available to everyone to explain why they voted a certain way or made a certain decision. The people should be foremost in all legislative work. 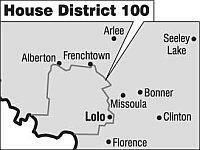 One of my main motivations for running for HD 91 is to return a certain set of principles to the Montana Legislature. I was principally raised by my grandma on my mother’s side. She was from a different era and she instilled an old-fashioned philosophy in me. First, speak honestly. Second, respect everyone, even people you disagree with. Third, be mindful and responsible. Admit when you’re wrong and be humble when right. These principles are my guides in life and this campaign. what citizens of this place we all treasure deserve. exceptions in this bill but only for those proposals that could PROVE their plant would have negligible emissions and environmental impact. I think we need new revenue allocated to education every session until Montana students are among the best in the world. I think Montana needs to come up with new ways to generate revenue besides raising taxes on someone every two years and that revenue should then be leveraged to cover as many people with medical insurance as possible. Finally, I think our freedoms and civil liberties need protected more intensely than ever so that the independence that’s characteristic of Montanans can continue against the Federal tightening of policy that has been occurring. Representative in Helena. Finally, I would ask, no matter what your opinion or position is, that you please vote on Tuesday, June 3 and in the General Election in November. It’s our government so use the ballot to say your piece. I caught this on KECI news last night, but there still isn’t any link to provide. If one does show up, I’ll update. But people – please! – leash those dogs when you hiking Mt. Jumbo or Mt. Sentinel or the Waterworks Hill. 2 sheep were killed recently when dogs were left to roam unleashed on Mt. Jumbo (pretty sure it was Jumbo). Sheep are used every year by local officials – who lease the sheep and their herder – to help manage weeds in the open space that surrounds this city. For those of you who don’t know, sheep can – literally – be scared to death. They’re pretty fragile animals, even the domestic ones. Lending leashes are available at the trailheads. USE THEM. While there aren’t any rules (this was said in the newstory) requiring people to leash their dogs in the open space, owners whose dogs that can’t stay under voice command are asked to leash their animals. Better safe than sorry – as unless your pooch is used to being around farm animals, you really should be leashing your pet. Like I said – it doesn’t take much to kill a sheep. It’s unnecessary, really, considering that not only are there lending leashes available, there are other local options for walking the dog. If you don’t like to leash your dog, head to Jacob’s Island dog park at 5th and Van Buren or go down to the state’s Forestry Division Nursery off of Spurgin – hell, there your dog can take a dip in the irrigation ditch. There’s plenty of other places too – another one that comes to mind is the open space down off of Tower, next to the river. Lots of place to run your pooch out there. Two events are planned for here in Missoula for Wednesday for the Obama campaign. First, Jean Carnahan, former Senator from Missouri and Betsy Myers, Nation Chair of Women for Obama will be in town this Wednesday for a special discussion over coffee, titled Women for Obama. The event is being held at the Florence Hotel, starting at 9:30 a.m.
Carnahan was the first woman from Missouri to serve in the Senate, taking the seat from 2001 to 2002 after her husband won the 2000 election posthumously. She is an advocate for on-site daycare centers for working families and Habitat for Humanity. Her son is two-term (seeking his third) Congressman John Russell Carnahan, of St. Louis. Meyers joined the Obama campaign in January 2007. She is the former White House Director of Women’s Initiative’s under the Clinton Administration. Second, Joan Ellen Davis, a republican, is hosting a Republicans for Obama event here in Missoula at the campaign headquarters on Front Street. The event begins at 5:45 p.m. Yes – Montana is actually going to experience a real presidential election cycle, folks. Very exciting. Former President Clinton’s been here a couple of times already, and Obama was in Bozeman and at the Crow Agency last week. Rumors abound, too, last week, that Chelsea was going to be here too. The b’birds: Missoula’s best right-wing site! I’m thrilled to say that 4&20 blackbirds is a well-known and appreciated right-wing blog! Jeez, I wonder what posts the dude read? Wulfgar! tells us the real definition of a maverick. I’m sure the rest of America will know it, too, immediately after the very first presidential debate. Will Rey Defy Freedom of Information Request? In order to meet the 20-day deadline under the FOIA, Rey and the USFS would have to provide the documents requested by the WildWest Institute by Monday, June 2nd. Oops. using the JH News & Guide article, dated Friday, I assumed from its wording that the dinner had already passed…so instead of this article reading “gave the keynote address” it has been changed to read “will give the keynote address. No wonder the state paper’s haven’t covered it yet! Governor Brian Schweitzer and Wyoming’s Governor Freudenthal will give the keynote addresses at Saturday’s dinner, which is the closing event for Wyoming’s State Democratic Convention. Wyoming as 6 superdelegates, only one of which has committed to a presidential candidate. Pete Jorgensen (of Jackson Wyoming) has committed to Barack Obama – the other 5 remain uncommitted. Wyoming also has 12 delegates to the Democratic National Convention, and those delegates will be chosen during this weekend’s convention. It will be a busy weekend with plenty of fun at The Cowboy Bar and The Silver Dollar, undoubtedly. Michael Shay, of hummingbirdminds, is there. Shay, an Obama delegate, and will also be blogging the DNC convention with Jay, Matt and I (and a whole bunch of others). It looks like we’re going to have to wait for Michael’s report once he gets back home – Wyoming papers don’t seem to have any coverage up (yet) of the gathering. Meanwhile, up the road at Jenny Lake Lodge in Grand Teton Park (maybe a 20 minute drive) is the Responsible Energy Development Symposium, sponsored by Trout Unlimited and being attended by more than 180 people. Sounds like something our Good Governor might be interested in – I wonder if he slipped in on that one too. This is really a non-post. I’m feeling guilty, as I won’t be getting anything up – other than this, I guess. Spent the whole day and better part of the early evening making a tour of the rivers. Rising waters – some impressive show mother nature is putting on in the Bitterroot. An amazing difference just 24 hours makes – and now thunder and lightening and rains so hard that I had to slow down to 30 mph – so the next 24 (peak was expected at midnight) will be all the more interesting. One property that I’ve been watching, I couldn’t get within 1/4 mile of the river – and I’ve got a pretty big truck. Up to the axles. Couldn’t risk it, too much water moving. Not puddling, but moving. Two bridges, and I’ve serious concern that neither will be there tomorrow. One is practically an absolute – it’s a old lumber and cribbing thing. I fully expect a good bit of the road to be gone too – but it really shouldn’t have been there anyways. Good riddance. Both Victor and Bell Crossing were so swollen, it looked like a Louisiana swamp. Water as far as you could see – water with trees growing out of it. No dirt. I was impressed with the show two years ago. Today I was out with some old timers, and we were all in awe. Anyways – sure wish I had the awakeness to post some pics – or a video or two. I’m tired. Tomorrow, I promise. Add floods, I guess, to that other list of volcanoes and earthquakes. A coalition of neighborhoods, along with a grant by the Office of Neighborhoods coalition of neighborhoods, along with a grant by the Office of Neighborhoods is helping fund a visit by Eben Fodor, author of Better, Not Bigger: How To Take Control of Urban Growth and Improve Your Community tonight in the community room at the Missoula Children’s Theater. This is a review of his book. Fodor will be discussing urban growth and community planning, in a discussion designed to help facilitate discussion with the city’s transportation and growth study, Envision Missoula, the Urban Fringe Development Area project (UFDA) (blogged about here), the Downtown Master Plan, and the two-year rewrite of zoning and subdivision regulations. Here’s another of a dozen or more opportunities to participate in a discussion, to hear an expert, and to help inform yourself on planning issues from an expert who sees the kinds of things that we face here in Missoula in places all over the U.S. – a guy who might be able to provide us with some insight as to what has been successful in other places, and what things may have not been so successful. It always amazes me how Missoulian’s seem to reinvent the wheel – and I’m not saying that we should be a version of some other fabulous place (like Seattle or Portland or Tacoma or Bozeman) – but it sure is smart, if you ask me, to inform yourself on how it is done in other places. Doesn’t it? Right now, you’ll only find news of this in the Canadian and UK press, but tucked away in what is being touted as the veto-proof Farm Bill, passed by both the House and Senate this week, is a late insertion by Senators Baucus, Snowe (R-Maine) and Chambiliss (R-GA) which ensures enforcement of the 2006 U.S.- Canada Softwood Lumber Agreement (SLA). SLA required Canadian exporters of softwood lumber to provide importers with proof that they have paid export taxes on their products. Canadians bemoan that it also includes enforcement measures like company audits, penalties, and fines. In plain language, the U.S. Importer Declaration Program provision will require the U.S. government to verify compliance with the agreement and impose penalties on importers who knowingly violate trade rules. It always amazes me that we need laws to enforce laws. Now, the U.S. has initiated 4 trade actions in international courts against Canada over what we’ve said is subsidized timber. Baucus, on the other hand, has spearheaded actions since at least 2002 to stop this flooding of the U.S. market with cheap Canadian timber. Currently available data indicates that Canada to date has under-collected SLA export taxes by about $50 million. The Canadian timber industry, on the other hand, is cutting its forests at an unsustainable rate. In other news, Stimson ushers out its last workers from the Bonner mill, all of whom face an uncertain future. Now, that Missoulian article I link to above overlooks one glaring statement by logging trucker Leroy Christofferson (“It’s for internal reasons that we don’t really know about yet”), by quickly launching into solely market statements – the Missoulian has yet to look into internal causes and reasons such as poor management and a union contract that was set for renewal this year – but even I have to admit that market forces are at play. Any downturn in the housing market, with subsidized Canadian timber in the mix, is going to magnify the effects on the U.S. market. But Baucus done good. It’s a shame that reform has to be tucked into these funding bills – remember, Baucus had unsuccessfully attempted to remove subsidies for big oil in the stimulus package, while moving that savings in subsidy over to tax credits for alternative energy – but if that’s the way it has to get done, then go ahead and get ‘er done, Max. Apparently, you got to give a little cash to get a little reform. Mt. St. Helen’s erupted 27 years ago today, back in 1980. I wasn’t here, but anytime someone mentions it, you’ll find me asking 50 questions. Consider that a warning, I guess. I know there was a hell of lot of ash that fell. On that note – I’d sure love to hear some stories, if any of our readers have ’em. Are the State Republicans Push-polling on Senator Max Baucus? News of this comes to us via jockyoung of Daily Kos, who received a push-polling call yesterday from “Central Research” – a mysterious New York research firm. With the Montana primary approaching, I just received an anti-Baucus push poll that was fairly well disguised as a legitimate poll. It wasn’t particularly nasty, but with standard push poll types of questions like “Would you be more or less likely to vote for Baucus if you knew he voted to raise your taxes over 200 times?” Has anyone else in Montana received this call yet? All I could get from the questioner was that he was calling out of New York and worked for “Central Research.” I don’t know if the fact that he had trouble reading the questions had anything to do with the nature of the outfit. Has anyone heard about this? Is this sufficiently egregious that we should look into it, or has this become standard campaign fare? The poll started off with a few minutes of various standard poll questions about voting preference, candidate favorability, and opinions on standard issues. They asked about all federal offices in Montana as well as Governor Schweitzer (which he couldn’t pronounce correctly). Although they tried to mix things up pretty well, it was clear they were focusing on Max Baucus (he even had trouble with that one). After a couple of rounds of that, it went directly to the push poll, starting with “Would you be more or less likely to vote for Baucus if you knew the following statements to be true.” I refused to answer each one of these, but stayed for all 10-15 of them to see what was going on. Besides being a push poll, I assume this was an attempt to find out which attack ads would have the most effect with voters – the questions were worded as typical attack-ad rhetoric. What do we do about these things? I don’t have time to go on a lone crusade to figure this out and complain, but I would certainly participate if others wanted to look into it. Has anyone else in Montana received this call yet? I’m wondering the same – has anyone gotten this call? – although they probably wasted little $ calling Missoula, I know we’ve got readers from other corners of the state. Dave Crisp of Billings Blog has a nice synopsis of the doings at Yellowstone County Democrat’s annual Truman Dinner this past weekend. I try not to pimp this blog out too much for personal causes, but I’m going to openly depart from that now to ask our readers to take a moment here to sign a petition at Media Matters, calling on the major news networks to report on the symbiotic relationship between military analysts and the network news. I’ve blogged about this issue here and here and here. In the face of a largely silent media, members of Congress – including Sens. John Kerry (D-MA), Carl Levin (D-MI), Frank Lautenberg (D-NJ), Hillary Clinton (D-NY), and Russ Feingold (D-WI), and Reps. Paul Hodes (D-NH), Rosa DeLauro (D-CT), Ike Skelton (D-MO), Peter DeFazio (D-OR) and John Dingell (D-MI) – have taken prompt action by calling for congressional hearings and investigations by the Department of Defense, the Government Accountability Office, and the Federal Communications Commission. Notice there is not one Republican on that list. I’ve also mentioned before that the right-wing blogosphere – including Montana’s conservative bloggers – have been silent on this too. How could they be silent to this in the face of this slap on the face of the troops? With so many Montanans serving? Signing that petition shouldn’t take more than 20 seconds or so….and if you have maybe 5 minutes to spare, why not take time to draft a short email to send to the email addresses that are provided on the side of that page I link to with the petition?